I have been searching forever for a copy of this game that worked. 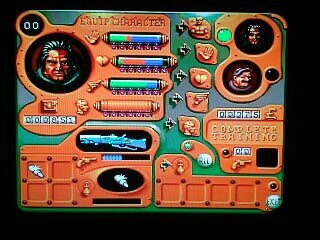 I have been a fan of top down action games since Midway’s Smash TV and Gauntlet series. 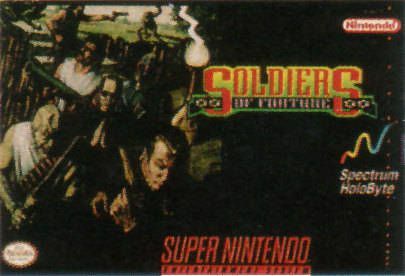 Most games of the genre like Ikari Warriors and Rambo for the Mega Drive are mostly straight forward, but a game like Soldiers of Fortune was rare at the time for me. With its forked paths, secret rooms, and various character attributes, there was more to survive this game than just getting to the end of a stage. GRAPHICS 6.5/10: Visually, the game looks pretty solid. Each of the four worlds look pretty different, and has a decent amount of life instilled in them, like the bubbling mud in World 1’s pits to the busted steam pipes and flickering lights in the seemingly abandoned buildings in World 2. Each of the six mercenaries you choose from look distinguished and gritty, and I can’t help but think about how cool a comic book series would be featuring these guys. The variety of enemies is not overly impressive. There at least three signature waves of foes that come at you; foot soldiers, quick-moving small baddies like frogs and beetles, and an area blasting turret/creature of some kind. It’s pretty crisp and there’s never a moment where you feel cluttered by the environment. There are a couple of problems with the game’s animation. Your character moves fairly quickly, which causes a mild strobe effect. I thought it was the tv I play on, but after connecting a HDMI to AV/audio jack, it was still there. This isn’t a huge issue, but the speed of the game can get the best of you when gauging where smaller projectiles are coming at you. I have run into so many fireballs and frogs, it made my head spin. SOUND 5.5/10: The sound is okay, but is lacking. While each stage has different background themes, the music is fairly repetitive, only slightly changing in pitch as you approach the end or midway point of the level. No variety of sound effects either. In some action games, certain sound queues will clue you in as to what enemies are nearby and approaching. 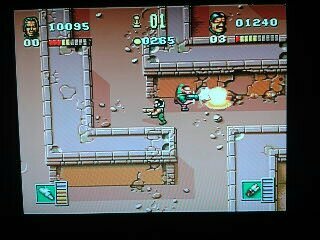 Soldiers of Fortune recycles the same grunting sound effect for EVERY creature that appears, and your gun emits no sound at all. The SNES is more than capable of producing better sound quality than this. Doom, for instance, has a rocking soundtrack and various monster sounds and other effects that was ported quite well from its CPU counterpart, so to say that I am a little disappointed is a bit of an understatement. Using your currency to boost you base stats is very vital, but is it more important to increase gun power or boost your life bar? GAMEPLAY 7/10: For a game that focuses on leveling baddies that bombard your path, SoF boasts a primitive, yet pretty engaging skill-boosting system to aid you along your quest as well as the six mercenaries you can choose from have varying attributes, so it’s a little more than just picking a face and blowing stuff up. Your characters are separated into two categories, depending on if you are playing solo or with a friend. The Brigand, for example, is pretty solid all around with decent speed, attack power, and an area affecting special weapon. 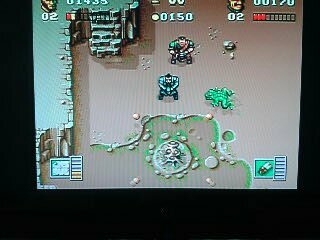 Giant lugs like the Thug and the Navvie, are heavy-armed, slow tanks who can do a lot of damage, but if the CPU controls the second player, there is a wisdom stat that determines intelligence. So if you pick these guys as your partner, expect them to destroy everything, including nodes that will release more enemies that you may not be prepared for. My strategy was to pick a powerful tank like the Mercenary and give the CPU a smart character like the Gentleman or the Scientist. They have low constitution and can die quickly, but make better decisions and can earn more money for you. The goal of each stage is, of course to reach the end, but not before activating various nodes that unlock passageways to get to other areas. They aren’t cleverly hidden or anything, but learning to withstand the wave of monster coming at you is key. Each stage can have up to 5 different nodes, including some extra ones that will boost your completion score and earn even more cash, which is critical. Your main actions are a simple fire button and special power button, B and Y respectively. The L and R shoulder buttons rotates your character, which helps with aiming a diagonal shot, but this is a time waste unless dispatching one of those aforementioned turrets. The regular enemies move way too fast to make use of this even with the quickest reflexes because you’ll just take damage. All in all, it’s a very simplistic game with wacky tricks, until you realize just how relentlessly hard this game is. DIFFICULTY 9/10:I’ve reviewed and talked at length about some hard games like Earthworm Jim and ONE, and in most cases I beat those games because I got better at them the more I played them. Even some other uphill challenges in my video game library could probably be beaten if I practiced more often, but SoF is just so mercilessly difficult that this game could not have meant for kids. Hell, I’m almost 30 and this game is still giving me fits!! And the problem isn’t really that it’s a cheap game, but it’s difficulty escalates way too soon. It’s only four worlds, each with about three to four individual levels, so it’s a relatively short game, but I found myself having some serious trouble after the first world. 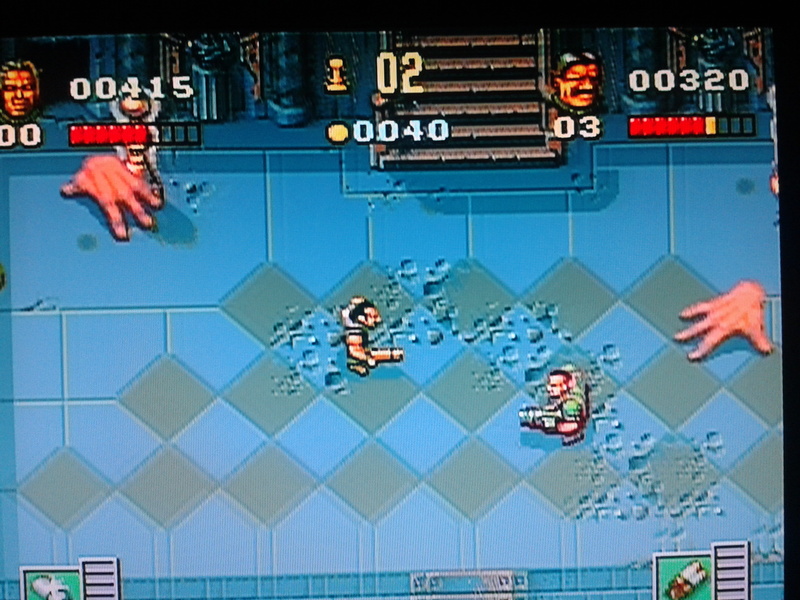 the enemies began to deal some major damage. Even after boosting my skill and adding health bonuses with the money I acquired from World 1, standard bad guys on the next stage could wipe me out in just several hits! Isn’t this supposed to be the intermediate portion of the game?! I’m not saying keep the kid gloves on, but don’t go from Q*Bert to Quake in three levels!! A giant mutant appeared out of this wall, just several feet from where I just was. My CPU aid caught him before he could do anything. These kind of suprise attacks are somewhat overwhelming in this game. And you can’t afford to get hit too many times if you are trying to preserve health for five main reasons. 1) There are not many health power ups in stages unless you can access some secret routes and 2) there is a good chance your idiot partner may need them as much if not more than you 3) which is bullocks if you try to share them, they don’t make up the difference of the damage/replenish ratio enough to justify, so just let him die and come back with a full bar. 4) Your health is not replenished when you complete a stage unless you BUY it for 75 coins, and this just refills one stock bar. So say if complete the level on your last hit and earned 1050 coins for those two areas, and you need to fill up 8 counters, it’s gonna cost you 600 to fill your life bar to max, leaving you with enough money for at least one other major upgrade!!! And 5) you are left with the dilemma of choosing to refill your life bar for that much, or buying an extra life for 500!! Extra lives are rare too. I have only gotten a few hidden in walls or pillars and I think 5000 points earns you one, but I’m not sure. Talk about being locked in an iron maiden filled with piss! Suffice it to say, you have try to take extra care to not endure any unnecessary damage or it will cost you dearly. I have had to reset my progress and do the game over just to make better purchases. Giant, mutant hands? Not only is this one of the freakier foes, but one of the hardest to kill with their speed and high constitution. And I haven’t even talked about how hard it can be to take down targets. Instinctively, you would try to boost the power of your gun as high an as quickly as you can, but damn, can these guys withstand some firepower. You enhance you gun to fire multiple shots at once or a stronger, wider beam, like Darius Twin or R Type, which is a good thing, but these monsters don’t go down easy. You need to bulk up your gun something fierce to prepare for the wave of madness that will ensnare you. These giant hands are the toughest things in the world, not only do they take lots of shots, but they come at you in numbers of about four, which may not sound like a lot, but unless you have some special shots on hand (HA!!!!! ), they’re gonna hit you and can kill you quickly, in about two hits! In some areas, you have to avoid acid-spewing volcanoes while fighting off hordes of regenerating foot soldiers and with the screen doing that strobe effect while you’re darting about, you might get a bit disoriented. Your partner helps you quite a bit in these tight spots, but more often he’s just too passive when you need an enforcer or too aggressive when trying to pick your spots and activates another wave of monsters. His knack for stealing your power ups will piss you off as well. one significant plus side is that checkpoints are a plenty, so you won’t find yourself backtracking unless you’re looking for secret weapon and health caches and when reloading your password save, allows you to respend the money you made from the previous level, which is really cool. 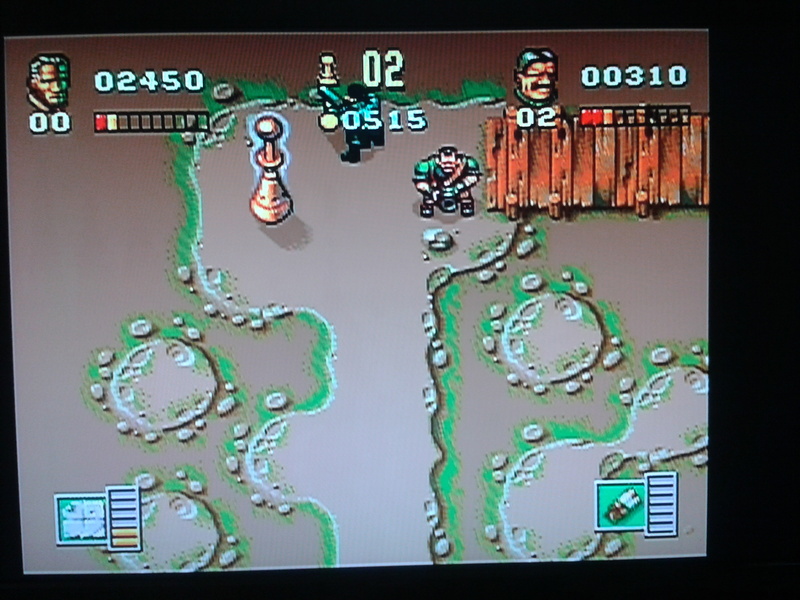 PROS: Badass looking cast of characters, multiple forks in road lead to various treasures, lots of checkpoints. CONS: Weak in the sound department, Intense and advanced difficulty might turn off some, more impressive games of the genre exist. 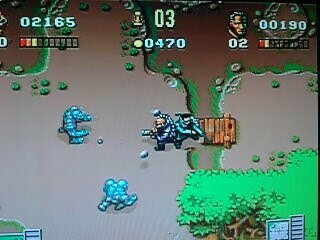 This entry was posted in Video Games and tagged action games, classic game review, retro games, shooting, SNES, Soldiers of Fortune, Spectro Holobyte, Super Nintendo, The Chaos Engine, top down view, Video Games. Bookmark the permalink.